The phylogenetic relationships between two orders of marsupials have been intesively debated. Authors benefited from recent sequencing projects which provided two marsupial genomes: this of the South American opossum (Monodelphis domestica)and the one of a kangaroo, the Australian tammar wallaby (Macropus eugenii). Retroposons are suitable and homoplasy-free markers: their insertion sites are random; parallel insertions or exact excisions are very rare. 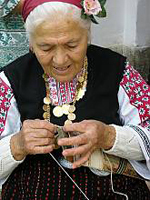 Thus, if one finds a retroposon in the homologous genomic loci of both species this indicates a common ancestry; on the contrary: if the marker is missing in one of the species, it means prior divergence.Moreover, one retroposon can insert into another: this situation is called transposition into transposition. These nested mobile elements insertions provide precious information about the relative times during which given retroposon families integrated into genomes: young elements can insert into older ones, but the reciprocal is impossible. SINEs active in both species => phylogenetically informative markers present in both lineages . Also, ~220,000 genomic loci containing retroposons were detected using three different strategies. After screening and experimental confirmation, a total of ~440 marsupial sequences were aligned and analyzed to reveal 53 informative markers. Ten of those confirmed again the monophyly of marsupials. The other 43 phylogenetically informative retroposon markers provide significant support for most of the basal splits within marsupials. Phylogenetic tree of marsupials derived from retroposon data. Authors did not find any loci containing elements present in opossum plus Paucituberculata but absent in kangaroo, which would have supported the alternative of a close relationship between Didelphimorphia and Paucituberculata. They screened for markers that would support the alternative hypothesis of Paucituberculata being the sister to all marsupials: experimental verification showed that all of the putative elements were also present in the order Paucituberculata (Rhyncholestes), thus supporting the monophyly of marsupials, but not the basal divergence. Furthermore, 13 of the original 53 markers were present in the South American Microbiotheria and the 4 Australasian orders but not in either Didelphimorphia or Paucituberculata: this significantly supports the monophyly of Australidelphia. The branch separating Australidelphia from Didelphimorphia and Paucituberculata is one of the strongest supported as well. Nevertheless, poor fossil record from South America, Antarctica, and Australia does not allow to assess Australidelphian early realtionships and biogeography. Two competing hypotheses exist regarding Microbiotheria: the latter are either excluded from the Australasian order (based on nuclear protein-coding genes) or embeded into it (completely or partially based on mitochondrial data). 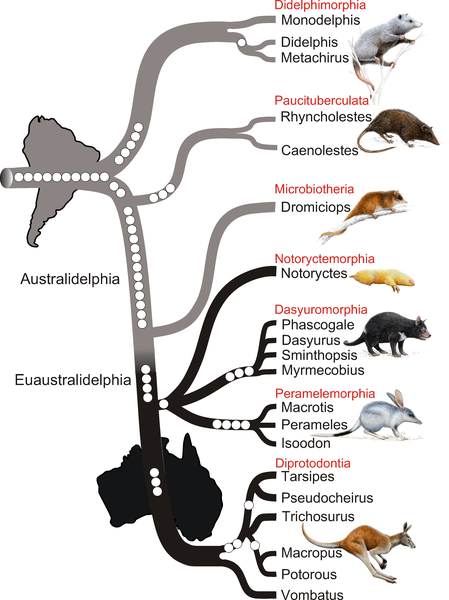 No reliable marsupial phylogeny is established up to now. In the present study, authors provide evidence for 4 independent diagnostic retroposon insertions which allow to place Microbiotheria within South America marsupials. Thus, authors propose the new name Euaustralidelphia for the monophyletic grouping of the four Australasian orders Notoryctemorphia, Dasyuromorphia, Peramelemorphia, and Diprotodontia. In total, 18 out of the initial 53 retroposon markers provide significant support for the monophyly of each of the five multi-species marsupial orders. Nice and short article in PLoS Biology about microarray analysis: Genome-scale hypothesis scanning, Gibson G (2003) Microarray Analysis. PLoS Biol 1(1): e15. P.S. It’ll be a mixture of French and English posts. Don’t accuse your browser of being crap because of French and English words messed around.